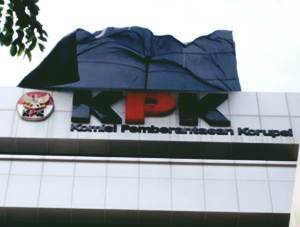 Komisi Pemberantasan Korupsi - KPK is the Indonesian Corruption Eradication Commission. KPK is an independent government agency in Indonesia which was formed to fight corruption. KPK was formed by the Government of Indonesia as an independent governemnt agency under the laws of the Republic of Indonesia No 30 of 2002 on the Indonesian Corruption Eradication Commission. KPK is based in Jakarta and its legal domicile is registered at Gedung KPK - Jl HR Rasuna Said Kav C1 Jakarta. According to KPK's profile as cited by JobsCDC.com, KPK is organised as 1 general secretariat and 4 deputies. KPK's deputies consist of Deputy Prevention, Deputy Repression, Deputy Information and Data, and Deputy PIPM. As of December 2014, KPK directly employs nearly 1,102 staff in all divisions. The Chairman of KPK is Agus Rahardjo for the the period 2015-2019. He was sworn by the President Joko "Jokowi" Widodo as the Chairman of KPK in 21 December 2015 to replace Taufiequrachman Ruki. The Chairman of KPK is supported by 4 deputy chairmans, namely Basaria Pandjaitan, Alexander Marwata, Saut Situmorang, and Laode M. Syarif. Hold an S1 degree from any field with min. GPA 2.75 (PTN) and 3.00 (PTS), preferably majoring in Law, Accounting, Management, Psychology, Education, Statistics, Informatics Management, Computer Science, Information Systems, Computer Engineering, Telecommunications, International Relations, English Literature, Agriculture, Mining, Forestry, Tourism & Hospitality, Communications, Broadcasting, Visual Communication Design, Sociology, Anthropology. Graduation year in 2016, 2015, 2014 and 2013. Not older tha 28 years of age onf the closing of registration period. Computer literate with minimum requirements : Microsoft Office. Fluent in foreign language and the local language is preferred. Have extensive experience in organization is a major advantage. JobsCDC.com now available on android device. Download now on Google Play here. Please be aware of recruitment fraud. The entire stage of this selection process is free of charge. Komisi Pemberantasan Korupsi - Recruitment Fresh Graduate IM 12 KPK October 2016 will never ask for fees or upfront payments for any purposes during the recruitment process such as transportation and accommodation.